Keep your eye out for camouflaged jungle creatures! On the Waterfall hiking tour, discover the hidden treasures of Oahu’s lush volcanic rainforest. This moderate 2-mile round-trip guided hike is a rare opportunity to explore 75-acres of sacred land that is exclusive only to the guests of our company. Experience the majestic beauty of a towering 150-foot Manoa waterfall, cross through tranquil streams, picturesque pools and view ancient lo`i (rock terraces) and lush tropical vegetation of Hawaii’s paradise. (Manoa waterfall on Monday through Friday … on Saturday the hiking destination is a 50 foot waterfall on Oahu’s windward coast). The hike to the waterfall is one mile each way, with a modest 100 foot vertical gain along the way. Time: Morning pickup in the Waikiki area is between 9:00am and 9:20am. Approximate return is 1:00pm. Tour includes: Complimentary round-trip transportation from Waikiki, Kahala, or Aloha Tower. Bottled water and trail snacks. 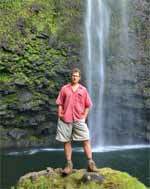 A professional nature guide will shuttle you by van to the lush Ko’olau Mountains on the windward side of O’ahu. 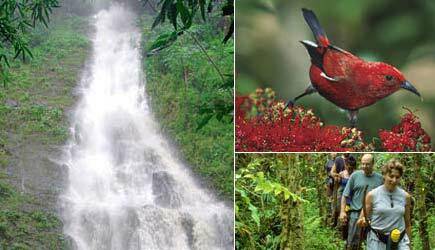 Then take a 1.5-mile roundtrip hike along a privately-owned jungle trail. At the end of the trail, enjoy a spectacular view of Oahu’s windward coast and a 30ft waterfall. This hike has less than 100’ elevation gain throughout the hike to falls. Experience the Ko‘olau Mountains, native and introduced species of flora and fauna, streams, pools and a cascading waterfall. What to Bring & Wear: Bring a camera, and dress comfortably. Wear good walking shoes and socks with good traction for dirt/mud. Combine the downhill bike tour with a 2 mile round trip hike in Manoa Valley to a 150 foot waterfall (50 foot Windward waterfall on Saturdays). 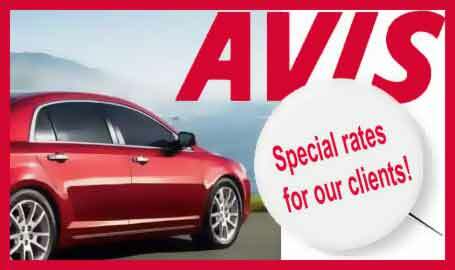 Round trip transportation from Waikiki (or a prearranged meeting point) is included. You will be shuttled to the trailhead and fitted with rain jackets (just in case). The hike follows a jungle stream with ancient rock terraces and mountain pools. Following your hike you’ll then head up the mountain for the biking portion of the tour, including a deli lunch served partway through your ride. Schedule: Tuesday, Thursday, and Saturday all year. Monday, Tuesday, Thursday, Friday, and Saturday for summer months. Gear provided: Rain poncho, hip pack, mosquito repellent, Kona mountain bike, and helmet. For those looking to squeeze a lot of adventure into one jam-packed day, there is a combo that does all three … start off with the waterfall hike, followed by the downhill bike, concluding with the snorkel/sail. Schedule: Tuesday, Thursday, and Saturday all year, and Monday, Tuesday, Thursday, Friday, and Saturday for summer months. Time: Approximately 9am to 5:30pm. Tour includes: Bottled water and trail snacks. Lunch is served during the biking portion of the tour. Gear provided: Kona mountain bike, helmet, and snorkel gear. Note: Snorkeling and sailing is weather / ocean conditions permitting. If conditions cause the boating portion of this three item combo to be canceled, you will be refund back down to the price of the bike / hike tour. The combo tours are with the Koʻolau Waterfall Hike, and in the summertime they do them with the Hawaiian Waterfall Hike. Tour includes: Complimentary round-trip transportation from Waikiki, Kahala, or Aloha Tower. Restrictions: This tour requires participants to be in moderately good shape and may be unsuitable for those with medical conditions. Children must be a minimum of 4 feet tall to ride a bike of their own, but tag-along trailers are available for younger children who are a minimum height of 3’5″ and are able to demonstrate bike riding ability. What to Bring & Wear: Dress comfortably and wear good walking shoes. Closed toed shoes are required for bike tours. This tour can work for cruise ship passengers who are arriving in Honolulu for the day. Call for details. Waikiki means “glistening waters” and it is thought to refer to the shimmering effect the late afternoon sun has on the surface of the ocean. While Waikiki is known for its beach and surf break, there are waterfalls in Waikiki as well! Almost every resort has one somewhere on the property. Unfortunately they are all fake! If you want to see a REAL waterfall you have to get out of town and do a little hiking. This tour offers you that chance!